One of the eariest maps to accurately show the true Northwest Passage. 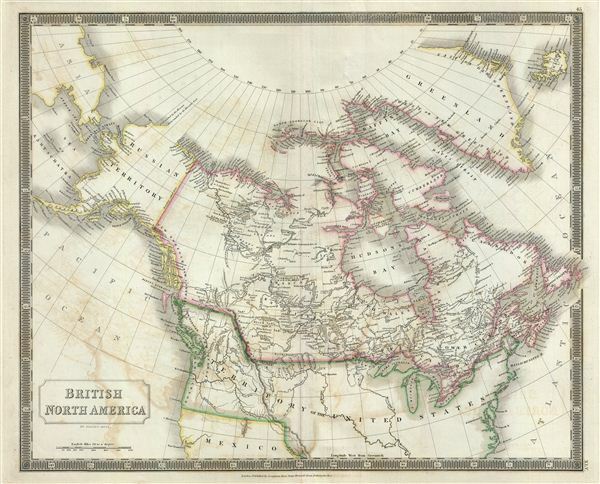 This is a fascinating map of British North America or Canada from Sidney Hall's extremely scarce 1835 New General Atlas. It covers from the North Georgian Islands to the United States including Greenland, Iceland and Russian Territories of what is now Alaska. Upper Canada (Ontario), Lower Canada (Quebec), Nova Scotia, New Brunswick and Prince Edward Island, Newfoundland are depicted in detail. The boundary settled in 1825 between Canada and the Russian Territories is noted here. It also shows all the Great Lakes Ontario, Erie, Superior, Michigan and Huron. The map offers copious notations throughout, such as 'The Indians descend it in three days' and 'Point reached by the Blossom's boat.' Also notes numerous American Indian nations including the Knisteneaux (Cree), Blood, Fall, Blackfoot, Hare, Copper, etc. This map is particularly interesting as it is one of the earliest maps to accurately depict the Northwest Passage, predating the Robert McClure expedition by more than 15 years. Hall correctly maps what are today called the Northwestern Passages between Baffin Bay and the Arctic Ocean. His mapping extends as far west as Melville Island and Banks Island, though does not include Prince Patrick Island. Even so, beyond Melville and Banks Islands, there is little but ice and seasonally open sea as far as Alaska and the Bearing Straits. Also of interest is Hall's concession of British Columbia to the United States as far north as 54 40,' a highly unusual move for a British cartographer. In the first half of the 19th century the Pacific Northwest was the last frontier in the century's long slaughter of the American beaver in the name of European fashion. Both the British, in the name of the Hudson Bay Company, and the Americans, championed by John Jacob Astor's Pacific Fur Company, were eager to claim monopolistic right over the region. Astor's establishment of Fort Astoria on the Columbia River, marked here but not specifically named, only served to further tensions with the Northwest Company - the Pacific subsidiary of the Hudson Bay Company. The dispute escalated, giving rise to the Oregon Boundary Dispute and the American expansionist slogan 'Fifty-four Forty or Fight!.' The dispute was not resolved until the 1846 Oregon Treaty which, through concessions on both sides, formally set the boundary at the 49th parallel. According to the earliest written accounts, the Russians were the first Europeans who reached Alaska and eventually became permanent settlers. The modern Canadian provinces and territories were under British and French control from the 16th century, until France gave up its claims in the Treaty of Paris in 1763. This map was drawn just prior to the Canadian Rebellions of 1837 against the British Empire which would eventually lead to a single colony of the United Province of Canada and the adoption of representative government by 1848. Canada would remain a collection of British colonies until its confederation in 1867, when the British colonies of Ontario, Quebec, New Brunswick and Nova Scotia would become Canadian provinces. Although known as the 'Birthplace of Confederation,' Prince Edward Island would only join the confederation in 1873. Very good. Original platemark visible. Minor wear and verso repair near original centerfold. Some offsetting. Blank on verso. Rumsey 4224.046 (1830 edition). Philips (Atlases) 758. Wheat, C.I., Mapping the Transmississippi West, no. 386.